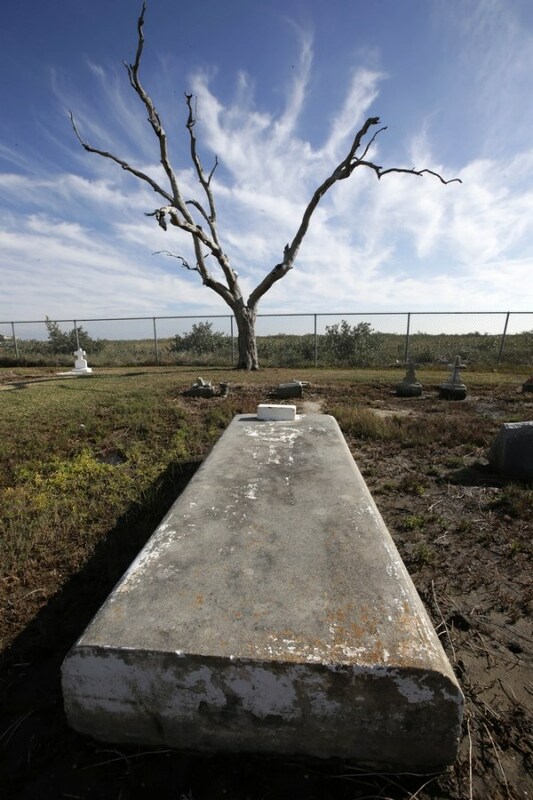 A leafless tree stands over graves in the Cheniere Caminada cemetery in Grand Isle, La. Many coastal Louisiana cemeteries are just skeletons of what they used to be. The Associated Press reports from Leeville, La. — As a young adult, Kathleen Cheramie visited her grandmother's grave in a tree-lined cemetery where white concrete crosses dotted a plot of lush green grass just off Louisiana Highway 1. Now, the cemetery in Leeville is a skeleton of its former self. The few trees still standing have been killed by saltwater intruding from the Gulf. Their leafless branches are suspended above marsh grass left brown and soggy from saltwater creeping up from beneath the graves. "It was a beautiful place to visit," said Cheramie, 67, who lives in nearby Golden Meadow. "It hurts to see it now." What's left of the old Leeville cemetery is only accessible by boat. 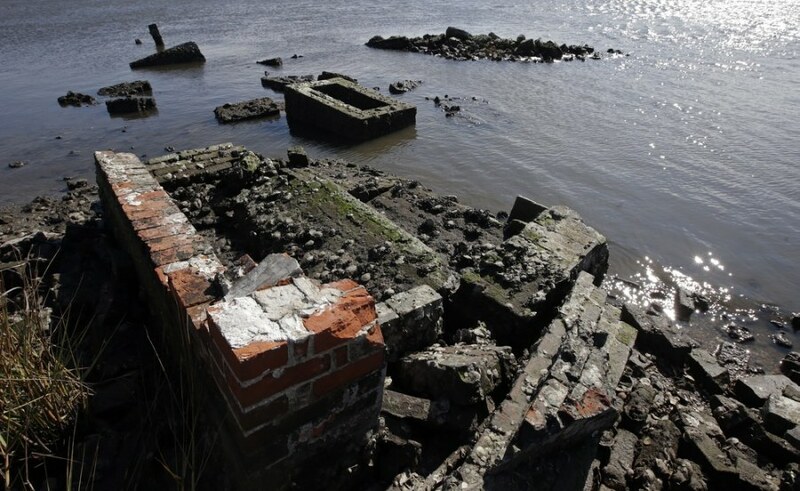 Some headstones are barely visible above the water, and waves lap at the bricks and concrete surrounding caskets buried at the site since the late 1800s. 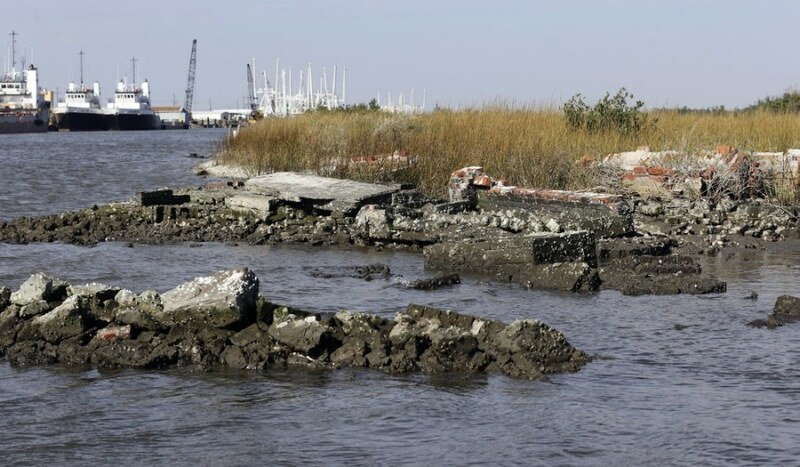 Much of the ground has subsided to barely sea level, and during Hurricane Isaac, about seven feet of land washed away in the tidal surge. 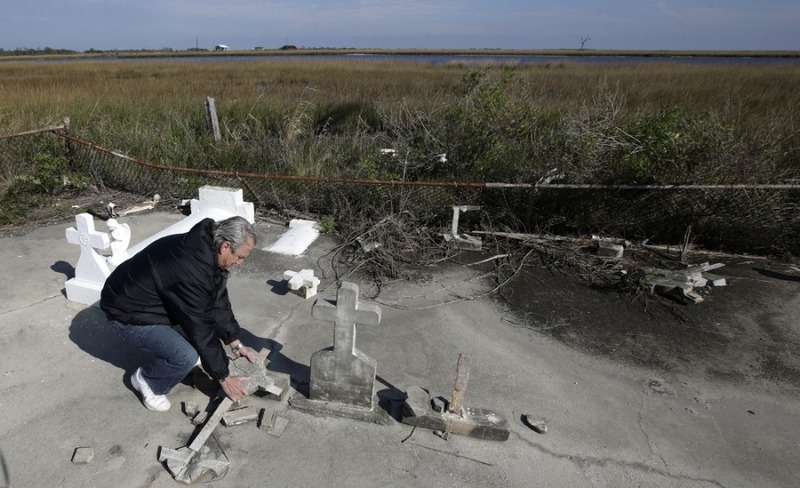 Cheramie's small family graveyard is among at least two dozen cemeteries across the southeast Louisiana coast that are rapidly sinking or washing away because of erosion and subsidence accelerated by the tropical punch of storms such as Katrina, Rita, Gustav, Ike, Lee and Isaac. Coastal Louisiana has lost about 1,900 square miles of land since the 1930s as canals dug for oil exploration allowed salty water to intrude into marshes and a succession of powerful hurricanes sucked marsh muck that protects populated areas out into the Gulf. Windell Curole handles pieces of headstone at his small family cemetery which sits along the bayou near Leeville. Curole said saltwater from the Gulf is causing a crippling subsidence problem. South Lafourche Levee District General Manager Windell Curole, who also serves on the state's Coastal Protection and Restoration Authority, said saltwater from the Gulf is causing a crippling subsidence problem. "We did not bury people in marshes," Curole said. "We buried them on high ground. This was high ground, and now it's subsided to the point of being wetlands and open water." Read the full story. Editor's note: Images taken on Dec. 29, 2012 and made available to NBC News today. Water washes around and against the tombs of those buried in a Leeville, La., cemetery.